Version and revision: V1.2 / R 0.8. 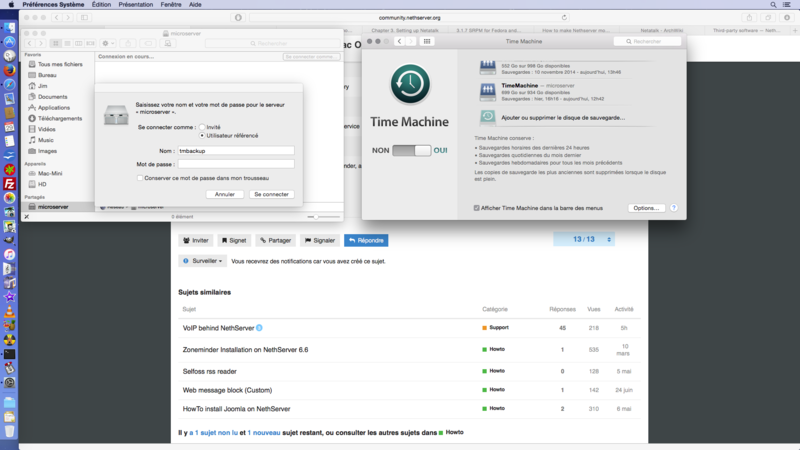 Made the installation of Netatalk to provide the Apple Filing protocol (AFP). Netatalk is an OpenSource software package, that can be used to turn a *NIX machine into an extremely high-performance and reliable file server for Macintosh computers. Nowadays, the Time Machine backup need the AFP to work and the Netatalk is in the version 3.1.7, at this date of presentation. I've got a 1 tb drive mount in /opt/timemachine. # but otherwise changes to the file are preserved. I want a specific user tmbackup to connect to the NetServer instance for making the backup. To build Netatalk we need at least “rpm-build”, “gcc” and “make” packages. The following messages don't have a problem. Build by using “rpmbuild” command. Check features and paths, using “afpd -V”. Now let's go to setup up the service, editing the “/etc/netatalk/afp.conf”.